Regulation (EC) No 661/2009 is a separate Regulation for the purposes of type-approval provided for in Directive 2007/46/EC. Regulation (EC) No 661/2009 repeals Council Directive 92/21/EEC of 31 March 1992 on the masses and dimensions of motor vehicles of category M1 (3) as well as Directive 97/27/EC of the European Parliament and of the Council of 22 July 1997 relating to the masses and dimensions of certain categories of motor vehicles and their trailers and amending Directive 70/156/EEC (4). The requirements relating to the masses and dimensions of motor vehicles and their trailers set out in those Directives should be carried over to this Regulation and where necessary, amended in order to adapt them to the development of technical and scientific knowledge. Regulation (EC) No 661/2009 lays down fundamental provisions on requirements for the type-approval of motor vehicles and their trailers with regard to their masses and dimensions. Therefore, it is necessary to also set out the specific procedures, tests and requirements for such type-approval. Council Directive 96/53/EC of 25 July 1996 laying down for certain road vehicles circulating within the Community the maximum authorised dimensions in national and international traffic and the maximum authorised weights in international traffic (5) lays down certain maximum authorised dimensions for both national and international traffic in the Member States. It is therefore important to take into account, for the purposes of the construction of vehicles, the dimensions which have already been harmonised in the Union in order to foster and ensure the free circulation of goods. Directive 97/27/EC allowed Members States to grant EC type-approval for vehicles the outermost dimensions of which did not match the maximum authorised dimensions provided for in that Directive. It also allowed Member States to refuse registration of vehicles that had been granted EC type-approval when their outermost dimensions did not meet the requirements of their national law. It is important to maintain the possibility to allow under certain conditions the type-approval of vehicles which exceed the authorised limits where this proves to be advantageous for road traffic and for the environment in the Member States where the road infrastructure is adapted to that situation. Therefore, the possibility to approve such vehicles under small series type-approval or individual approval schemes should be ensured, provided that the quantity of vehicles that may benefit from a derogation pursuant to Article 23 of Directive 2007/46/EC as regards the maximum authorised dimensions is limited to what is necessary for the purposes of this Regulation. Annex XII to Directive 2007/46/EC should therefore be amended to include such quantitative limits. Directive 96/53/EC lays down maximum authorised masses that are applicable only to international traffic. However, that Directive allows the Member States to continue to apply their national legislation for national traffic. As a consequence, the harmonisation of the technically permissible maximum laden mass and the technically permissible maximum mass on the axles or on a group of axles for the purposes of circulation in the Member States does not appear to be feasible in the short term. Nevertheless, due to the existence of non-harmonised rules on the construction of the road infrastructure, it is appropriate to require Member States to determine the registration/in service maximum permissible masses of vehicles that are permitted for national traffic or for international traffic under Directive 96/53/EC and to establish a procedure for such determination. Given the experience gained in the application of Union legislation concerning masses and dimensions of vehicles, it is necessary to provide for clearly defined concepts. Some of those concepts have already been defined in Directives 97/27/EC and 92/21/EEC. For reasons of consistency, its is appropriate to take over those definitions and, where necessary, to adapt them in the light of technical and scientific knowledge. Given that the definition of the actual mass of an individual vehicle has been included in this Regulation, it is necessary, in order to avoid confusion in filling in the certificate of conformity, to amend Annex IX to Directive 2007/46/EC accordingly. Since the White Paper ‘Roadmap to a Single European Transport Area – Towards a competitive and resource efficient transport system’ (6) has underlined the need to improve the aerodynamic performance of road vehicles and research has shown that fuel consumption of motor vehicles and therefore CO2 emissions could be significantly reduced by fitting aerodynamic devices to vehicles, it is important to allow the fitting of such aerodynamic devices to vehicles. Given that aerodynamic devices consist in adds-on that, due to their design, protrude beyond the outermost part of the vehicles at the back or laterally, they should be included in the list of devices or equipment that are not taken into account for the determination of the outermost dimensions. However, it is essential to limit their protrusion at the back and laterally so that road safety is not impaired and inter-modality transport remains possible. The necessary technical requirements should therefore be set out in this Regulation. Available software makes possible the use of virtual testing methods based on computer-aided techniques. Given that those techniques allow for more cost-efficient and less burdensome testing, it is appropriate to provide for the possibility to use them for checking whether a vehicle is able to manoeuvre in a complete trajectory of 360° and for measuring the maximum rear swing-out when the vehicle is manoeuvring inside the trajectory. It is therefore also necessary to add this Regulation to the list of regulatory acts included in Annex XVI to Directive 2007/46/EC. With a view to ensuring the proper operation of the type-approval system, it is appropriate to update the Annexes to Directive 2007/46/EC. Annexes I, III, IX, XII and XVI to Directive 2007/46/EC should therefore be amended accordingly. Since the provisions of Annex XII are sufficiently detailed and need no further transposition by Member States, it is therefore appropriate to replace it by means of a Regulation in accordance with Article 39(8) of Directive 2007/46/EC. 1. This Regulation lays down the requirements for the EC type-approval of motor vehicles and their trailers with regard to their masses and dimensions. 2. This Regulation applies to incomplete, complete and completed vehicles of categories M, N and O. ‘indivisible load’ means a load that cannot, for the purposes of carriage by road, be divided into two or more loads without undue expense or risk of damage and which, owing to its mass or dimension, cannot be carried by a vehicle the masses and dimensions of which comply with the maximum authorised masses and dimensions applicable in a Member State. the technically permissible maximum masses at the coupling point(s) taking into account the technical features of the couplings that are fitted or can be fitted to the vehicle as the case may be. 2. When determining the masses referred to in paragraph 1, the manufacturer shall take into account the best practices of good engineering and the best available technical knowledge in order to minimise the risks of mechanical failure, in particular those due to fatigue of materials, and to avoid damage to the road infrastructure. 3. When determining the masses referred to in paragraph 1, the manufacturer shall take into account the maximum speed by construction of the vehicle. Where the vehicle is equipped by the manufacturer with a speed limitation device, the maximum speed by construction shall be the true speed permitted by the speed limitation device. 4. When determining the masses referred to in paragraph 1, the manufacturer shall not impose restrictions on the use of the vehicle except those concerning the tyre capacities that can be adjusted to the speed by construction as is allowed under UNECE Regulation No 54 — Uniform provisions concerning the approval of pneumatic tyres for commercial vehicles and their trailers (10) and in Section 5 of Annex II to Commission Regulation (EU) No 458/2011 (11). 5. For incomplete vehicles, including chassis-cabin vehicles, that require a further stage of completion, the manufacturer shall provide all relevant information to the next stage manufacturers so that the requirements of this Regulation continues to be fulfilled. For the purposes of the first subparagraph, the manufacturer shall specify the position of the centre of gravity of the mass corresponding to the sum of the load. 6. Incomplete vehicles of categories M2, M3, N2 and N3 not fitted with a bodywork shall be designed so as to allow the subsequent stage manufacturers to be able to fulfil the requirements of Sections 7 and 8 of Part B and Section 6 and 7 of Part C of Annex I. 1. The manufacturer or his representative shall submit to the type-approval authority the application for EC type-approval of a type of vehicle as regard its masses and dimensions. 2. The application shall be drawn up in accordance with the model information document set out in Part A of Annex V.
the technically permissible maximum laden mass of the combination. The information shall be provided in tabular or any other appropriate format, in agreement with the type-approval authority. 4. Where the optional equipment significantly affects the masses and dimensions of the vehicle, the manufacturer shall provide the technical service with the location, mass and geometrical position of the gravity centre with respect to the axles of the optional equipment that can be fitted to the vehicle. 5. By way of derogation from paragraph 4, where the optional equipment is made up of several parts located in various spaces in the vehicle, the manufacturer may provide the technical service with the distribution of the mass of the optional equipment on the axles only. 6. For groups of axles, the manufacturer shall indicate the load distribution among the axles of the total mass applied to the group. Where necessary, the manufacturer shall state the distribution formulae or produce the relevant distribution graphs. 7. Where the approval authority or the technical service deems it necessary, they may request the manufacturer to make available a vehicle representative of the type to be approved for the purposes of inspection. 8. The vehicle manufacturer may submit an application for recognition of the equivalence of a suspension to air suspension to the type-approval authority. The type-approval authority shall recognise the equivalence of a suspension to air suspension where the requirements of Annex III are fulfilled. Where the technical service has recognised the equivalence, it shall issue a test report. The type-approval authority shall attach the test report and a technical description of the suspension to the EC type-approval certificate. 9. Where the requirements set out in Annexes I to IV, of this Regulation are met, the approval authority shall grant a type-approval in accordance with the numbering system set out in Annex VII to Directive 2007/46/EC. A Member State shall not assign the same number to another vehicle type. 10. For the purposes of paragraph 9, the type-approval authority shall deliver an EC type-approval certificate established in accordance with the model set out in Part B of Annex V.
the registration/in-service maximum permissible laden mass of the combination. National authorities shall establish the procedure for the determination of the registration/in service maximum permissible masses referred to in the first subparagraph. They shall designate the competent authority entrusted with the determination of those masses, and shall specify the information that must be provided to that competent authority. 2. The registration/in-service maximum permissible masses determined in accordance with the procedure referred to in paragraph 1 may not exceed the maximum masses referred to in Article 3(1). 3. The manufacturer shall be consulted by the competent authority as regards the mass distribution on the axles or group of axles in order to ensure the proper functioning of the systems of the vehicle, in particular the brake- and steering system. 4. When determining the registration/in-service maximum permissible masses, national authorities shall ensure that the requirements of the regulatory acts listed in Annex IV and Annex XI to Directive 2007/46/EC continue to be fulfilled. 5. Where national authorities concludes that the requirements of one of the regulatory acts listed in Annex IV and Annex XI to Directive 2007/46/EC, with the exception of this Regulation, are no longer fulfilled, they shall require that fresh tests are conducted and a new type-approval or an extension as the case may be, be granted by the type-approval authority that has granted the initial type-approval under the regulatory act in question. 1. Without prejudice to Article 4(3) of Directive 96/53/EC, an EC type-approval may be granted for vehicles the dimensions of which exceed the requirements of this Regulation that are intended for the transport of indivisible loads. In such a case, the type-approval certificate and the certificate of conformity shall clearly indicate that the vehicle is intended for the transport of indivisible loads only. 2. Member States may grant approvals under Articles 23 and 24 of Directive 2007/46/EC for vehicles exceeding the maximum authorised dimensions set out in point 1.1 of Parts B, C and D of Annex I to this Regulation. Type-approvals under Article 23 of Directive 2007/46/EC shall be subject to the quantitative limits set out in Section 3 of Part A of Annex XII to that Directive. 1. National authorities shall permit the sale and entry into service of vehicles type-approved before the date referred to in Article 13(2) of Regulation (EC) No 661/2009 and shall continue to grant extensions to approvals granted under the terms of Directive 92/21/EEC and Directive 97/27/EC. 2. By way of derogation from paragraph 1, EC type-approvals granted pursuant to Article 7 of Directive 97/27/EC shall cease to be valid on the date referred to in Article 19(1) of Regulation (EC) No 661/2009. However, Member States may register and permit the sale or entry into service of end-of-series vehicles whose EC type-approval is no longer valid where the manufacturer so requests, in accordance with Article 27 of Directive 2007/46/EC. 3. As from 10 January 2014 manufacturers shall deliver certificates of conformity which are in accordance with this Regulation. Until 9 January 2014 they shall indicate the actual mass of the vehicle in entry 52 of the certificate of conformity, unless it is indicated in one of the other entries of the certificate of conformity. Annexes I, III, IX, and XVI to Directive 2007/46/EC are amended in accordance with Annex VI to this Regulation. Annex XII to Directive 2007/46/EC is replaced by Annex VII to this Regulation. It shall apply to new vehicle types for which type-approval is granted from 1 November 2012. (3) OJ L 129, 14.5.1992, p. 1. (5) OJ L 235, 17.9.1996, p. 59. (7) OJ L 227, 28.8.2010, p. 1. (8) OJ L 351, 20.12.2008, p. 44. (9) OJ L 255, 29.9.2010, p. 1. (10) OJ L 183, 11.7.2008, p. 41. (11) OJ L 124, 13.5.2011, p. 11. Technical requirements for vehicles of category M1 and N1. Technical requirements for vehicles of category M2 and M3. Technical requirements for vehicles of category N2 and N3. Technical requirements for vehicles of category O. List of devices and equipment that are not required to be taken into account for the determination of the outermost dimensions. Permissible deviations for type-approval and conformity of production. Conditions of equivalence of a suspension to air-suspension. Technical requirements for the installation of lift- or loadable axles on vehicles. Amendments to Annexes I, III, IX, and XVI to Directive 2007/46/EC. Annex XII to Directive 2007/46/EC. For the purposes of measurement of the length, width and height, the vehicle shall be at its mass in running order, placed on a horizontal and flat surface with tyres inflated at the pressure recommended by the manufacturer. Only the devices and equipment referred to in Appendix 1 of this Annex shall not be taken into account for the determination of the length, width and height. 2.1. The sum of the technically permissible maximum mass on the axles shall not be less than the technically permissible maximum laden mass of the vehicle. 2.2. The technically permissible maximum laden mass of the vehicle shall not be less than the mass of the vehicle in running order plus the mass of the passengers plus the mass of the optional equipment plus the mass of the coupling if not included in the mass in running order. 2.3. Where the vehicle is laden to the technically permissible maximum laden mass, the mass on each axle shall not exceed the technically permissible maximum mass on that axle. 2.4. Where the vehicle is laden to the technically permissible maximum laden mass, the mass on the front axle shall in no event be less than 30 % of the technically permissible maximum laden mass of the vehicle. 2.4.1. Where the vehicle is laden to the technically permissible maximum laden mass plus the technically permissible maximum mass at the coupling point, the mass on the front axle shall in no event be less than 20 % of the technically permissible maximum laden mass of the vehicle. 2.5. Where a vehicle is equipped with removable seats, the verification procedure shall be limited to the condition with the maximum number of seating positions. the masses of the passengers, the pay-mass and the mass of the optional equipment shall be distributed as prescribed in points 2.6.2 to 2.6.4.2.3. 2.6.1.1. The seats where adjustable shall be moved to their rearmost position. 2.6.1.2. Where there are other possibilities for adjusting the seat (vertical, angled, seat back, etc.) the adjusted positions shall be as specified by the vehicle manufacturer. 2.6.1.3. In the case of suspension seats, the seat shall be locked in the position specified by the manufacturer. 2.6.2.1. The mass representing each passenger shall be 75 kg. 2.6.2.3. In the case of special purpose vehicle, the requirement of point 2.6.2.2 shall apply mutatis mutandis (for example, mass of an injured person lying on the stretcher in the case of an ambulance). 2.6.3.1. The mass of the optional equipment shall be distributed in accordance with the manufacturer’s specifications. As regards M1 vehicles, the pay-mass shall be distributed in accordance with the manufacturer’s specifications in agreement with the technical service. As regards vehicles intended to be fitted with a fifth wheel coupling, the manufacturer shall state the minimum and maximum fifth wheel lead. 2.7.1. The requirements referred to in points 2.2, 2.3 and 2.4 shall apply taking into account the mass of the coupling and the technically permissible maximum mass at the coupling point. 2.7.2. Without prejudice to the requirements of point 2.4, the technically permissible maximum mass on the rear axle(s) may be exceeded by not more than 15 %. 2.7.2.1. Where the technically permissible maximum mass on the rear axle(s) is exceeded by not more than 15 %, the requirements of point 5.2 of Annex II to Commission Regulation (EU) No 458/2011 (1) shall apply. 2.7.2.2. In the Member States where the road traffic legislation allows it, the manufacturer may indicate in an appropriate supporting document, such as the owner’s manual or the maintenance book that the technically permissible maximum laden mass of the vehicle may be exceeded by not more than 10 % or 100 kg, whichever value is lower. This allowance shall apply only when towing a trailer in the conditions specified in point 2.7.2.1 provided that the operating speed is restricted to 100 km/h or less. 1,5 times the technically permissible maximum laden mass of the towing vehicle in the case of an off-road vehicle as defined in Annex II to Directive 2007/46/EC. However, the technically permissible maximum towable mass shall in no case exceed 3 500 kg. half of the mass in running order of the towing vehicle. The technically permissible maximum towable mass shall in no case exceed 750 kg. 3.2. The technically permissible maximum mass at the coupling point shall not be less than 4 % of the maximum permissible towable mass and not be less than 25 kg. 3.3. The manufacturer shall specify in the owner’s manual the technically permissible maximum mass at the coupling point, the mounting points of the coupling on the towing vehicle and the maximum permissible rear overhang for the coupling point. 3.4. The technically permissible maximum towable mass shall not be defined by reference to the number of passengers. The technically permissible maximum laden mass of the combination shall not exceed the sum of the technically permissible maximum laden mass plus the technically permissible maximum towable mass. The towing vehicle shall be able to start the vehicle combination five times on an uphill gradient of at least 12 % within five minutes. In order to conduct the test described in point 5.1, the towing vehicle and the trailer shall be laden as to equal the technically permissible maximum laden mass of the combination. the technically permissible maximum mass on the group of axles designated ‘j’, where j varies from 1 to the total number of groups of axles. 2.1.1. Suitable calculations shall be carried out in order to make sure that the following requirements are fulfilled for each technical configuration within the type. 2.1.2. In the case of vehicles fitted with loadable axles, the following calculations shall be carried out with the suspension of the axles loaded in the normal operating configuration. 2.2.1. The sum of the technically permissible maximum mass on the solo axles plus the sum of the technically permissible maximum mass on the groups of axles shall not be less than the technically permissible maximum laden mass of the vehicle. 2.2.2. The mass of the vehicle in running order, plus the mass of the optional equipment, the mass of the passengers, the masses ‘WP’ and ‘B’ referred to in point 2.2.3, plus the mass of the coupling if not included in the mass in running order, plus the technical permissible maximum mass at the coupling point shall not exceed the technically permissible maximum laden mass. maximum permissible mass of the luggage in kg stated by the manufacturer, including the maximum permissible mass (B’) that may be transported in the ski-box if any. 2.2.3.2. The mass Q and Qc of the seated passengers shall be located at the seating reference points (i.e. the ‘R point’ of the seat). 2.2.3.3. The mass corresponding to the number SP of standing passengers of mass Q shall be uniformly distributed over the surface available for standing passenger S1. 2.2.3.4. Where appropriate, the mass WP shall be uniformly distributed over each wheelchair space. 2.2.3.5. A mass equal to B (kg) shall be uniformly distributed in the luggage compartments. 2.2.3.6. A mass equal to B’ (kg) shall be located at the centre of gravity of the ski-box. 2.2.3.7. The technically permissible maximum mass at the coupling point shall be located at the coupling point the rear overhang of which is stated by the vehicle manufacturer. The mass of each crew member shall be 75 kg. 2.2.3.9. The number of standing passengers shall not exceed the value S1/Ssp, where Ssp is the rated space provided for one standing passenger as specified in the table in point 2.2.3.8. 2.2.4.1 The requirements of point 2.2.2 shall be verified in all interior arrangement configurations. 2.2.4.2. In the conditions specified in point 2.2.3 the mass on each solo axle and on each group of axles shall not exceed the technically permissible maximum mass on that axle or group of axles. with all possible wheelchair spaces occupied followed by the remaining area for standing passengers (up to the standing capacity limit stated by the manufacturer, if reached) and then the remaining seats available for use occupied. 2.2.5. Where the vehicle is laden as specified in point 2.2.2 the mass corresponding to the load on the front steering axle(s) shall in no case be less than 20 % of the technically permissible maximum laden mass ‘M’. 2.2.6. Where a vehicle is to be type-approved to more than one class, the requirements of Section 2 shall apply to each class. The technically permissible maximum towable mass shall not exceed 3 500 kg. The technically permissible maximum mass at the coupling point shall be at least equal to 4 % of its technically permissible maximum towable mass, or 25 kg, whichever is the greater. The manufacturer shall specify in the owner’s manual the conditions for the attachment of the coupling to the motor vehicle. Where appropriate the conditions referred to in point 4.2 shall include the technically permissible maximum mass at the coupling point of the towing vehicle, the maximum permissible mass of the coupling device, the mounting points of the coupling and the maximum permissible rear overhang of the coupling. Vehicles designed to tow a trailer shall be capable of starting five times within five minutes at an up-hill gradient of at least 12 %. For performing the test described in point 5.1, the towing vehicle and the trailer shall be laden so as to equal the technically permissible maximum laden mass of the combination. The engine shall provide a power output of at least 5 kW per tonne of the technically permissible maximum laden mass of the combination or of the technically permissible maximum laden mass of the solo vehicle where the vehicle is not designed to tow a trailer. The engine power shall be measured in accordance with Council Directive 80/1269/EEC (2) or UNECE Regulation No 85 (3). The vehicle shall be capable of manoeuvring on either side of a complete trajectory of 360° as shown in Figure 1 in Appendix 3 to this Annex without any of the vehicle’s outermost points protruding beyond the outer circle or intruding inside the inner circle as the case may be. The test shall be conducted with the vehicle in both the unladen conditions (i.e. at its mass in running order) and loaded to its technically maximum permissible laden mass. For the purposes of point 7.1, the parts permitted to protrude beyond the vehicle width referred to in Appendix 1 to this Annex shall not be taken into account. For vehicles fitted with a loadable axle, the requirement of point 7.1 shall also apply where the loadable axle(s) is in service. 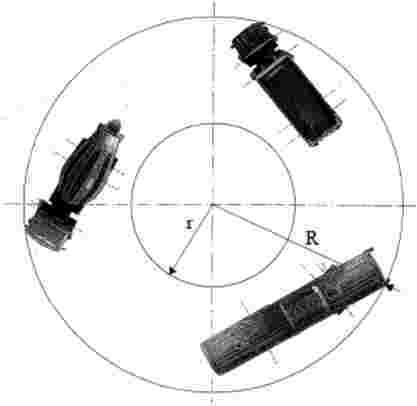 The outermost front point of the motor vehicle shall be guided along the contour of the outer circle (see Figure 1 in Appendix 3 to this Annex). 8.1.1. The vehicle shall be tested in accordance with the drive-in test method described in point 8.1.2. The vehicle shall be stationary, a vertical plane tangential to the side of the vehicle and facing outwards from the circle shall be established by marking a line on the ground. The vehicle shall be moved from a straight line approach into the circular area described in Figure 1 with its front wheels turned such as the front outermost point follows the contour of the outer circle (see Figure 2a of Appendix 3 to this Annex). 8.1.3. The vehicle shall be set to its mass in running order. 8.1.4. The maximum rear swing-out shall not exceed 0,60 m.
8.2.1. The requirements of point 8.1 shall apply mutatis mutandis as regards vehicles with two or more sections. In such a case, the two or more rigid sections shall be aligned with the plane as shown in Figure 2b of Appendix 3 to this Annex. Suitable calculations shall be carried out in order to make sure that the requirements set out in points 2.2 and 2.3 are fulfilled for each technical configuration within the type. In the case of vehicles fitted with loadable axles, the calculations required under points 2.2 and 2.3 shall be carried out with the suspension of loadable axles in the normal running configuration. In the case of vehicles fitted with lift axles, the calculations required under points 2.2 and 2.3 shall be carried out with the axles lowered. The sum of the technically permissible maximum mass on the solo axles plus the sum of the technically permissible maximum mass on the groups of axles shall not be less than the technically permissible maximum laden mass of the vehicle. For each group of axles designated ‘j’, the sum of the technically permissible maximum mass on its axles shall not be less than the technically permissible maximum mass on the group of axles. In addition, each of the masses mi shall not be less than the part of μj applying on the axle ‘i’ as determined by the mass distribution for that group of axles. The mass of the vehicle in running order, plus the mass of the optional equipment plus the mass of the passengers, plus the mass of the coupling if not included in the mass in running order plus the technically permissible maximum mass at the coupling point shall not exceed the technically permissible maximum laden mass of the vehicle. Where the vehicle is laden to its technically permissible maximum laden mass, the mass distributed on an axle ‘i’ shall not exceed the mass mi on that axle, and the mass on the group of axles ‘j’ shall not exceed the mass μj. the vehicle shall be at its mass in running order plus the mass of the optional equipment plus the mass of the passengers located at the seating reference points, plus the mass of the coupling (if not included in the mass in running order), plus the maximum permissible mass at the coupling point, plus the pay-mass being distributed uniformly on the cargo area. the vehicle shall be at its mass in running order plus the mass of the optional equipment plus the mass of the passengers located at the seating reference points, plus the mass of the coupling (if not included in the mass in running order), plus the maximum permissible mass at the coupling point, plus the pay-mass located in accordance with the manufacturers specifications. For such purposes the manufacturer shall state the extreme permissible possible positions of the centre of gravity of the pay-mass and/or body and/or equipment or interior fittings (for instance: from 0,50 m to 1,30 m in front of the first rear axle). The requirements of points 2.3.3.1 and 2.3.3.2 shall be fulfilled simultaneously. Example, a tipper lorry (distributed load) equipped with an additional crane (localised load). the vehicle shall be at its mass in running order plus the mass of the optional equipment plus the mass of the passengers located at the seating reference points, plus the mass of the coupling if not included in the mass in running order, plus the maximum permissible mass at the fifth wheel coupling point located in accordance with the manufacturers’ specifications (minimum and maximum fifth-wheel lead). The requirements of points 2.3.3.1 shall always be fulfilled where the vehicle is fitted with a flat cargo area. Where the vehicle is laden to its technically permissible maximum laden mass, plus the mass of the coupling if not included in the mass in running order, plus the maximum permissible mass at the coupling point in such a way that the maximum permissible maximum mass on the rear group of axle (μ) or the maximum permissible maximum on the rear axle (m) is reached, the mass on the front steering axle(s) shall not be less than 20 % of the technically permissible maximum laden mass of the vehicle. As regards special purposes vehicles of category N2 and N3, the technical service shall check compliance with the requirements of Section 2 in agreement with the manufacturer, taking into account the specific design of the vehicle (for example, mobile cranes). Vehicles designed to tow a trailer and laden to their technically permissible maximum laden mass of the combination shall be capable of starting five times within five minutes at an up-hill gradient of at least 12 %. As regard gradeability, off road vehicles shall be tested against the technical requirements of Annex II. The requirements of Section 5 of Appendix 1 to Annex II to Directive 2007/46/EC shall also apply. Vehicles shall provide an engine power output of at least 5 kW per tonne of the technically permissible maximum laden mass of the combination. In the case of a road tractor, or a tractor unit for semi-trailer intended for the transport of indivisible loads, the engine power shall be at least 2 kW per tonne of the technically permissible maximum laden mass of the combination. The engine power shall be measured of in accordance with Directive 80/1269/EEC or UNECE Regulation No 85. The vehicle shall be capable of manoeuvring on either side of a complete trajectory of 360° as shown in Figure 1 of Appendix 3 to this Annex without any of the vehicle’s outermost points protruding beyond the outer circle or intruding inside the inner circle as the case may be. For the purposes of point 6.1, the parts permitted to protrude beyond the vehicle width referred to in Appendix 1 to this Annex shall not be taken into account. For vehicles fitted with axle-lift devices, the requirement of point 6.1 shall also apply with the lift axle(s) in the lifted position and where the loadable axle(s) is in service. 7.1. The vehicle shall be tested in accordance with the steady-state test method described in point 7.1.1. The vehicle shall be stationary and shall have its front steered wheels so directed that if the vehicle moves, its outermost point would describe a circle of 12,50 m radius. A vertical plane tangential to the side of the vehicle and facing outwards from the circle shall be established by marking a line on the ground. The vehicle shall move forward such as the front outermost point follows the contour of the outer circle of 12,50 m radius. 1,00 m where the rearmost axle is a steered axle. Semi-trailer: 12,00 m plus the front overhang. 2,60 m for vehicles fitted with a bodywork with insulated walls of at least 45 mm thick, as referred to in Appendix 2 to Annex II to Directive 2007/46/EC. 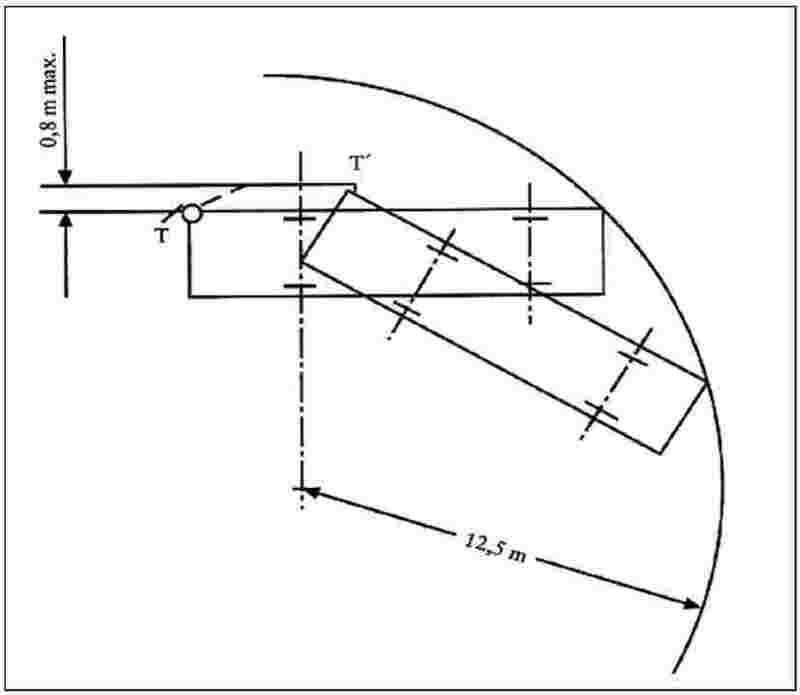 Front fitting radius of semi-trailer: 2,04 m.
The measurement of the length, height and front fitting radius shall be conducted where the loading surface or the reference surface referred to in point 1.2.1 second subparagraph of Annex 7 to UNECE Regulation No 55 is horizontal. Adjustable drawbars shall be horizontal and aligned with the centre-line of the vehicle. They shall be set at their horizontal most elongated position. Only the devices and equipment referred to in Appendix 1 to this Annex shall not be taken into account for the determination of the dimensions referred to in point 1.1. 2.1.1. Suitable calculations shall be carried out in order to make sure that the requirements set out in points 2.2 and 2.3 are fulfilled for each technical configuration within the type. 2.1.2. In the case of vehicles fitted with loadable axles, the calculations required under points 2.2 and 2.3 shall be carried out with the suspension of loadable axles in the normal running configuration. 2.1.3. In the case of vehicles fitted with lift axles, the calculations required under points 2.2 and 2.3 shall be carried out with the axles lowered. 2.2.1. The sum of the technically permissible maximum mass at the front coupling point plus the technically permissible maximum mass on the solo axles or group of axles plus the technically permissible maximum mass at the rear coupling point shall be not less than the technically permissible maximum laden mass of the vehicle. 2.2.2. For each group of axles designated ‘j’, the sum of the masses mi on its axles shall not be less than the mass μj. 2.3.1. The mass of the vehicle in running order, plus the mass of the optional equipment plus the technically permissible maximum mass at the coupling point(s) shall not exceed the technically permissible maximum laden mass of the vehicle. 2.3.2. Where the vehicle is laden to its technically permissible maximum laden mass, the mass distributed on a solo axle ‘i’ shall neither exceed the mass mi on that axle, nor the mass μj on the group of axles, nor the technically permissible maximum mass at the coupling point m0. The vehicle shall be at its mass in running order plus the mass of the optional equipment plus the pay-mass located in accordance with the manufacturer’s specifications. 2.3.3.4. The requirements of points 2.3.3.1 shall always be fulfilled where the vehicle is fitted with a flat cargo area. is the overall length of the body length as defined in point 6.1.2 of Standard ISO 7237:1981. 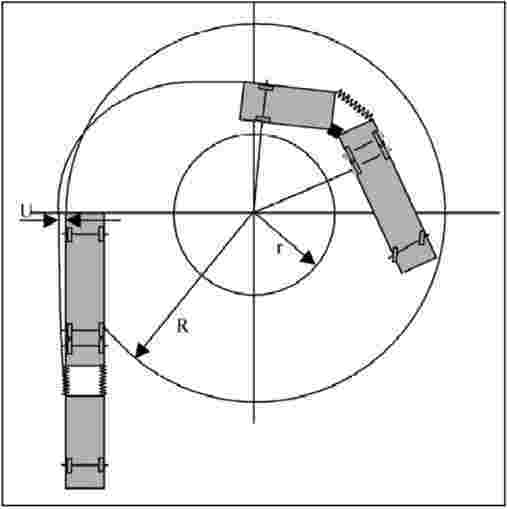 Trailers and semi-trailers shall be so designed that, when coupled to a towing vehicle, the combination is capable of manoeuvring on either side of a complete trajectory of 360° made up of two concentric circles, the outer circle having a radius of 12,50 m and the inner circle having a radius of 5,30 m without any of the vehicle’s outermost points of the towing vehicle protruding beyond the outer circle or any of the outermost points of the trailer or semi-trailer intruding inside the inner circle. 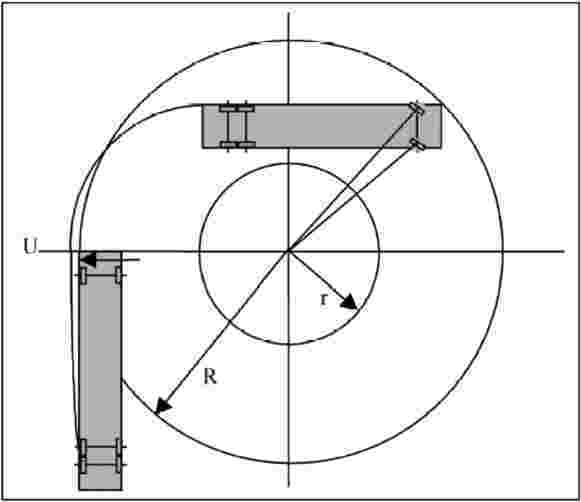 is the distance between the king-pin axis and the centre line of the non-steering axles. Where one or more of the non-steering axles has an axle lift device the reference wheelbase with the axle lowered or the axle lifted — whichever is the longest — shall be taken into account. (1) OJ L 124, 13.5.2011, p. 11. (2) OJ L 375, 31.12.1980, p. 46. (3) OJ L 326, 24.11.2006, p. 55. With the exception of rear-view mirrors, the total protrusion of devices and equipment added to the width of the vehicle shall not exceed 100 mm. The requirements set out in points (a) and (b) of paragraph 1 shall not apply to devices for indirect vision. Lift platforms, access ramps or similar equipment (when they are in undeployed position and do not protrude by more than 300 mm) provided that the loading capacity of the vehicle is not increased. Optional lamps as defined in Section 2 of UNECE Regulation No 48 (3). Foldable devices and equipment designed to reduce aerodynamic drag provided that they do not protrude at the back by more than 500 mm from the outermost length of the vehicle and they do not increase the length of the loading area. Such devices must be designed so as to be retractable when the vehicle is at stand-still in such a way that the maximum authorised length is not exceeded and they do not impair the capability of the vehicle to be used for intermodal transport. Retractable lateral guidance devices intended for use on guided bus system, if not retracted. Devices and equipment especially designed to reduce aerodynamic drag provided that they do not protrude by more than 50 mm on each side from the outermost width of the vehicle and they do not increase the loading capacity. Such devices must be designed so as to be retractable when the vehicle is at stand-still in such a way that the maximum authorised width is not exceeded and they do not impair the capability of the vehicle to be used for intermodal transport. Where the devices and equipment are in service, the vehicle width shall not exceed 2 650 mm. Devices for securing the tarpaulin and their protection not projecting by more than 20 mm where they are no more than 2,0 m from the ground level and no more than 50 mm where they are more than 2,0 m from the ground level. The edges shall be rounded to a radius of not less than 2,5 mm. Protruding flexible parts of a spray-suppression system referred to in Commission Regulation (EU) No 109/2011 (4). Flexible mudguards not covered under entry 14. Safety railings on vehicle transporters. Only for vehicles designed and constructed to transport at least two other vehicles and for which the safety railings are more than 2,0 m but not more than 3,70 m from the ground and do not project by more than 50 mm from the outermost side of the vehicle. The vehicle width shall not exceed 2 650 mm. (1) OJ L 177, 10.7.2010, p. 211. (2) OJ L 35, 4.2.2009, p. 1. (3) OJ L 135, 23.5.2008, p. 1. (4) OJ L 34, 9.2.2011, p. 2. Measurement of the overall length, width and height shall be carried out in accordance with point 1.2 of Parts A to D of this Annex. Under the condition that the limits specified in point 1.1 of Part A to D of this Annex are not exceeded, the actual dimensions may differ from those stated by the manufacturer by not more than 3 %. The mass in running order shall be checked from the actual mass by weighing the vehicle and deducting the mass of the optional equipment fitted. For such purposes the weighing instrument shall comply with the requirements of Directive 2009/23/EC of the European Parliament and of the Council (1). 5 % as regards the permissible lower and upper deviations (= the negative and positive deviation around the declared value) for the purposes of Article 12(2) of Directive 2007/46/EC. (1) OJ L 122, 16.5.2009, p. 6. 1.1. This Annex lays down the technical requirements for the purposes of verifying the gradeability of a vehicle in order to be categorised as off-road vehicle in accordance with Section 4 of Part A of Annex II to Directive 2007/46/EC. 1.2. The technical service shall verify if the complete or completed vehicle, or tractor unit for semi-trailer is to be considered as an off-road vehicle in accordance with the requirements laid down in Annex II to 2007/46/EC. 1.3. For incomplete vehicles, this verification shall be carried out only at the request of the manufacturer. The vehicle shall be set in the conditions recommended by the manufacturer and fitted with the equipment referred to in Annex I to Directive 2007/46/EC. The adjustment of the brakes, clutch (or equivalent), engine and gear box shall be set in accordance with the manufacturer’s recommendations for the purposes of use off the normal roads. The tyres shall be those recommended for off-roads use. They shall have a tread depth of not less than 90 % of the tread depth of a new tyre. The tyre pressure shall be adjusted to the value recommended by the tyre manufacturer. The vehicle shall be loaded at its technically permissible maximum laden mass with a load distribution proportional to the distribution of the maximum mass on the axles as stated by the manufacturer. For example a vehicle of 7,5 tonnes with a maximum mass on the front axle of 4 tonnes and a maximum mass on the rear axle of 6 tonnes shall be tested with a mass of 3 tonnes (40 %) on the front axle and 4,5 tonnes (60 %) on the rear axle. The gradient shall show a continuous percentage of 25 % with a tolerance of + 3 % (θ = 14 degrees). In agreement with the manufacturer, the test may be performed on a gradient that shows a percentage greater than 25 %. The test shall be conducted with maximum masses reduced in relation to the test conditions. These conditions shall be reported. The surface of the track shall show a good coefficient of adhesion. The Skid Resistance Index (‘SRI’) of the surface shall be measured in accordance with Standard CEN/TS 13036-2: 2010 Road and airfield surface characteristics – Test methods – Part 2: Assessment of the skid resistance of a road pavement surface by use of dynamic measuring systems. The mean value of the SRI shall be reported. 3.1. The vehicle shall be first placed on a horizontal surface. 3.2. The mode of traction shall be set as for off-roads use. The gear(s) engaged shall allow a steady speed. 3.3. Sections 4 and 5 of Appendix 1 to Annex II to Directive 2007/46/EC shall apply. 1. This Annex lays down the technical conditions relating to the equivalence of a suspension to air-suspension for vehicle driving axle(s). Each axle shall be fitted with hydraulic dampers. On groups of axles, the dampers shall be positioned to minimise the oscillation of the groups of axles. The mean damping ratio Dm shall be more than 20 % of critical damping for the suspension in its normal condition with hydraulic dampers in place and operating. The damping ratio Dr of the suspension with all hydraulic dampers removed or incapacitated shall be not more than 50 % of Dm. The frequency of the sprung mass above the driving axle or group of axles in a free transient vertical oscillation shall not be higher than 2,0 Hz. The test procedures for measuring the frequency and damping shall be laid down in point 3. ‘K’ is the total vertical stiffness between the road surface and the sprung mass (N/m). The damping ratio as a fraction of critical is C/Co. During free transient oscillation of the sprung mass the vertical motion of the mass will follow a damped sinusoidal path (Figure 2). The frequency can be estimated by measuring the time for as many cycles of oscillation as can be observed. The damping can be estimated by measuring the heights of successive peaks of the oscillation in the same direction. ‘ln’ being the natural logarithm of the amplitude ratio. subjected to other procedures insofar as it has been proved by the manufacturer, to the satisfaction of the technical service, that they are equivalent. The vehicle shall be fitted with a vertical displacement transducer between driving axle and chassis, directly above the driving axle. From the trace, the time interval between the first and second compression peaks shall be measured to obtain the damping. For twin driving groups of axles, vertical displacement transducers shall be fitted between each driving axle and the chassis directly above it. The tyres shall be inflated to the appropriate pressure recommended by the manufacturer. The test for verifying the equivalence of the suspensions shall be made at the technically permissible maximum mass on the axle or group of axles, and the equivalence assumed to cover all the lower masses. If a vehicle is fitted with one or more lift- or loadable axles it shall be ensured that under normal driving conditions the registration/in-service maximum permissible masses on solo axles or groups of axles are not exceeded. To that end the lift- or loadable axle(s) shall be lowered to the ground or be loaded automatically if the nearest axle(s) of the group or the front axle(s) of the motor vehicle is/are laden to its/their registration/in- service maximum permissible mass(es). Where a lift axle is in elevated position, it shall be ensured that the mass on the steering axle(s) continues to be sufficient to ensure the safe driving of the vehicle in all circumstances. For such purposes, the vehicle manufacturer shall specify, in the case of incomplete vehicles, the minimum mass on the steering axle(s). Every axle-lift device fitted to a vehicle, as well as the systems for its operation, shall be designed and installed in such a manner as to protect them against any improper use or tampering. after the vehicle has moved off and before its speed exceeds 30 km/h, the axle(s) shall automatically be lowered again to the ground or be reloaded. Information document No … relating to the EC type-approval of a motor vehicle and their trailers with regard the masses and dimensions of a vehicle. 2.4.1.4.1. Approach angle (15) (16): … degrees. 2.4.1.5.1. Departure angle (18) (16): … degrees. 2.4.2.4.1. Approach angle (15) (16): … degrees. 2.4.2.5.1. Departure angle (18) (16): … degrees. 2.11.4.2. Maximum V-value: … kN. If the means of identification of type contains characters not relevant to describe the vehicle, component or separate technical unit types covered by this information document, such characters shall be represented in the documentation by the symbol ‘?’ (e.g. ABC??123??). This figure shall be rounded off to the nearest tenth of a millimetre. Determined in accordance with the requirements of Council Directive 80/1268/EEC (33). Information package (all pages must bear the stamp of the type-approval authority). For vehicles fitted with a suspension that is recognised to be equivalent to air suspension, the test report and the technical description of the suspension. (1) Classified according to the definitions set out in Part A of Annex II. (2) ‘Forward control’ as defined in point 2.7 of Annex I to Council Directive 74/297/EEC (). (3) OJ L 165, 20.6.1974, p. 16. (5) Standard ISO 612: 1978 – Road vehicles – Dimensions of motor vehicles and towed vehicles – terms and definitions. (6) Optional equipment that affects the dimensions of the vehicle shall be specified. term No 6.1 and for vehicles other than those of category M1. In the case of trailers, the lengths shall be specified as mentioned in term No 6.1.2 of Standard ISO 612: 1978.
term No 6.2 and for vehicles other than those of category M1. term No 6.3 and for vehicles other than those of category M1. (16) Only for the purpose of definition of off-road vehicles. (20) The mass of the driver is assessed at 75 kg. The liquid containing systems (except those for used water that must remain empty) are filled to 100 % of the capacity specified by the manufacturer. The information referred to in points 2.6(a) and 2.6.1(a) do not need to be provided for vehicle categories N2, N3, M2, M3, O3, and O4. (21) For trailers or semi-trailers, and for vehicles coupled with a trailer or a semi-trailer, which exert a significant vertical load on the coupling device or the fifth wheel, this load, divided by standard acceleration of gravity, is included in the maximum technically permissible mass. (22) ‘Coupling overhang’ is the horizontal distance between the coupling for centre-axle trailers and the centreline of the rear axle(s). (23) Set out in such a way as to make the actual value clear for each technical configuration of the vehicle type. (24) In the case of a vehicle that can run either on petrol, diesel, etc., or also in combination with another fuel, items shall be repeated. In the case of non-conventional engines and systems, particulars equivalent to those referred to here shall be supplied by the manufacturer. (25) Determined in accordance with the requirements of Council Directive 80/1269/EEC (). (26) OJ L 375, 31.12.1980, p. 46. (27) Delete where not applicable (there are cases where nothing needs to be deleted when more than one entry is applicable). (28) The specified particulars are to be given for any proposed variants. (29) For tyres of category Z intended to be fitted on vehicles whose maximum speed exceeds 300 km/h equivalent information shall be provided. (30) The number of seating positions to be mentioned shall be the one when the vehicle is in motion. A range can be specified in case of modular arrangement. (31) ‘R-point’ or ‘seating reference point’ means a design point defined by the vehicle manufacturer for each seating position and established with respect to the three-dimensional reference system as specified in Annex III to Directive 77/649/EEC (). (32) OJ L 267, 19.10.1977, p. 1. (33) OJ L 375, 31.12.1980, p. 36. As defined in Annex II, Section A. The mass of the driver is assessed at 75 kg. in the ‘Explanatory notes relating to Annex IX’, note (f) is deleted. Check of compliance with the manoeuvrability requirements including manoeuvrability of vehicles fitted with lift- or loadable axles. the maximum number of vehicles of one or more types may not exceed 10 %, in the case of category M1, and may not exceed 30 % of the vehicles of all types concerned put into service in that Member State during the previous year, in the case of all other categories. Should 10 %, respectively 30 %, be less than 100 vehicles, then the Member State may allow the putting into service of a maximum of 100 vehicles.